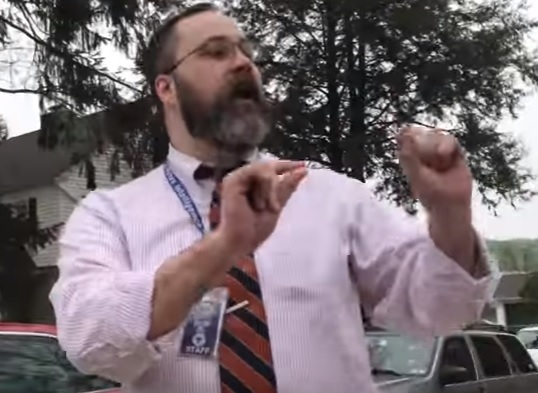 In April Downingtown STEM Academy vice principal Zach Ruff screamed at pro-life students holding a sidewalk protest and attempted to rip up their signs. Alliance Defending Freedom reported on the settlement today. The Downingtown Area School District has agreed to clarify its administrative policies to ensure that public sidewalks surrounding its schools are open to free speech. As part of a settlement to avoid being sued in court, the Philadelphia-area school district will take immediate steps to prevent incidents like the one that occurred in April when a 40-year-old administrator physically intimidated and shouted expletives at two teens, who were peacefully expressing their pro-life views on a public sidewalk near the school. One of the teens captured Vice Principal of Student Life Zach Ruff on video, in which he angrily demanded that they “shut up,” eventually attempting to rip a sign out of their hands, which could constitute assault and battery in Pennsylvania.